It doesn't get much fresher. Milling fresh flour for baking gives one an opportunity to think a bit more about this most basic of ingredients. We keep two big tubs of grain on hand, one rye and one wheat, bought in 20kg sacks, and grind them into flour as needed. So far, it has mostly been for bread baking, but we're pursuing the logical conclusion here and using fresh milled in a greater variety of baked goods, which hitherto we'd made from bought white flour. I wasn't entirely clear on how the higher gluten content is achieved in strong white flour or even on the exact differences between brown, wholegrain and white flour and so simply carried on using most of them for one recipe or another. Bran goodness on top of porridge oats. An offhand comment from a baking friend about higher gluten brown flour being made simply by sifting out the bran prompted a bit of an RGL flour policy review. I soon discovered that it was possible to use my own freshly milled flour for bread recipes that call for strong white and even for pizza bases, just by sifting out the bran. Then the scientific brain kicked into gear and I looked into it all a little more rigorously. It was an obvious step to check just what was being sifted out, so I weighed what was coming out of the mill before and after sifting and found that I was removing 20% of the flour mass, which by the way doesn't go to waste as we mix it in with our porridge oats, giving the morning porridge a new texture, flavour and level of nutrition! In this marvellous information age, when potentially all factoids are there at your fingertips, my curiosity, about what this meant in terms of the composition of a grain of wheat and how it compares with commercially produced flours, was soon satisfied. 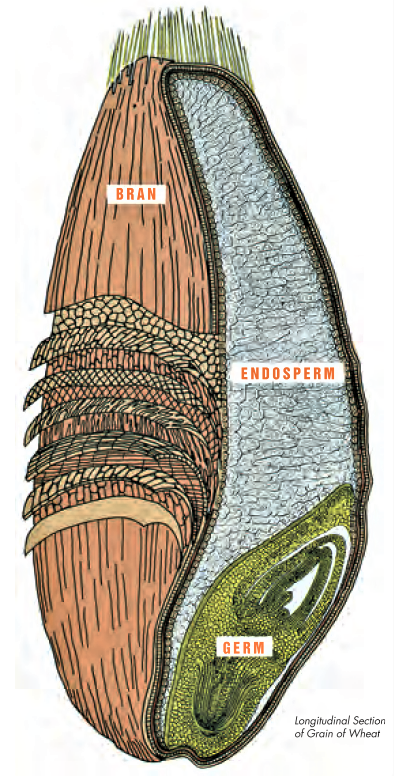 The wheat kernel has three component parts: the endosperm, bran and germ. White flour is derived from the endosperm, which makes up approximately 83% of kernel weight. Bran makes up about 14.5% of kernel weight and is included in whole wheat flour. The germ comprises about 2.5% of kernel weight and is the part that grows into a new wheat plant. Included in whole grain flour. These numbers agree surprisingly well with my quick check on the flour mass separated by sifting and suggest that the enrichment for endosperm is quite high. What are the nutritional considerations? The germ is typically separated from the grain during commercial milling, since its higher fat content limits the shelf life of the resulting flour, but it also has a very high nutritive value, with plenty of trace minerals, unsaturated fats, B vitamins, antioxidants, phytochemicals and high quality protein. Milling the flour at home means that all this goodness is kept in, so I'm happy about that. The bran is high in fibre, trace minerals, B vitamins and has a small amount of protein. Ideal for the porridge. The endosperm is mostly protein (that's what gluten is) and carbohydrates (starch), but also has small amounts of B vitamins, iron and soluble fibre. Altogether, this is good stuff and milling fresh is the ideal way to get the maximum goodness out of it. Not only that, but it's cheaper as well. Now that's almost too good to be true.